Chinese MahJongg tiles share many characteristics with dominoes, both of them being made up of tiles with symbols, that lend themselves to many different games. Mah Jongg is a Chinese game played with 144 tiles -- small rectangular blocks of wood or ivory with a face showing various characters and designs. There are 108 suit tiles (bamboo, circles, and characters), 28 honor titles (winds and dragons), and 8 flower tiles. The game is known under a large number of alternate names, including Mah Jong, Ma Chiao, Mo Tsiah, Ma Chiang, Ma Cheuk, Ma Jong, Man Chu, Mah Diao, Ma Chong, Mah Chong, Pung Chow, Ching Chong, Kong Chow, Mah Deuck, Mah Cheuk, Ma Chiang, Pe Ling, Lung Chan, Mah Lowe, Baak Ling, and more. The game (at least in computer versions), is played in two primary ways: traditional and solitaire. The traditional game is played with four players, while the solitaire game is played with one, and consists entirely of matching tiles from various layouts. 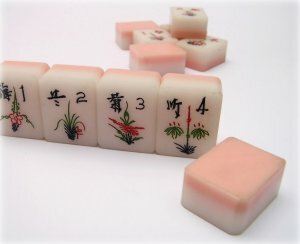 American Mah-Jongg Association - Formed in 1999 to promote, foster, expand, and increase the popularity of the game of Mah-Jongg. We are made up of a consortium of expert players, developers, and enthusiasts, all dedicated to bring you the best of Mah-Jongg. Board Game Central - Information, rules, software, and links for the game of Mah Jongg. Board Game Central is the web's premier site for traditional & family board games. Mah Jong Museum - The first museum dedicated to the preservation of this fascinating game of ancient China. Learn about the history of the game, rules from around the world, articles, photos, and view one of the world's largest collections of vintage Mah Jong tiles sets. Nan's Mah Jong Notes - Nanette Pasquarello's informative introduction to the game of Mah Jongg, with tile illustrations and descriptions, rules, strategy tips, scoring instructions, and more. Sloperama.com's MAH-JONGG Zone - Need information about Mah Jongg or Ma Jong? This comprehensive site has tiles, sets, bulletin board, tutorials, and more. The National Mah Jongg League - For 66 years, the National Mah Jongg League has been the arbitrator for everything that relates to American Maajh. The League started with 32 members and today numbers approxiamately 200,000.